Lift one of the eight peg puzzle pieces to see and hear what’s happening inside the firehouse and all around the neighborhood! 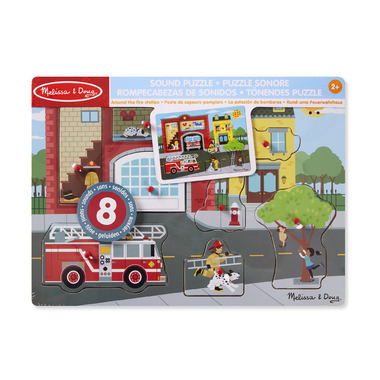 This unique sound puzzle lets kids two and older discover a fire alarm waking up a sleeping firefighter, a fire crackling in an apartment, a cat being rescued from a tree, and much more. Replace the piece to immediately stop the sound and move to the next scene! Kids two and older will love exploring in and around the fire station, discovering new, full-color pictures under each piece, and learning what is making the realistic sounds. The interactive, sturdy wooden puzzle helps develop fine motor skills and auditory processing skills, and encourages problem solving and narrative thinking. Sounds are activated by a light sensor, so the puzzle doesn't work in dim light (this is a pro and con!). Noises are quite loud and there's no off switch/volume control. Got this for our 2 year old Grandson for Christmas. He just loves it, wouldn't put it down. It was a definite hit.